The Tiger which was released in the Bhimgad Wildlife Sanctuary jungles, which the villagers said to be a man eater has been located in the jungles Amgaon and Gavali villages of Khanapur taluka. The expert team comprises 2 veterinarians, group of experts in handling the predator, forest department staff and local persons who know the territory thoroughly. The terrain is uneven and dense, hence causing a lot of hindrances to actually capture the Tiger. 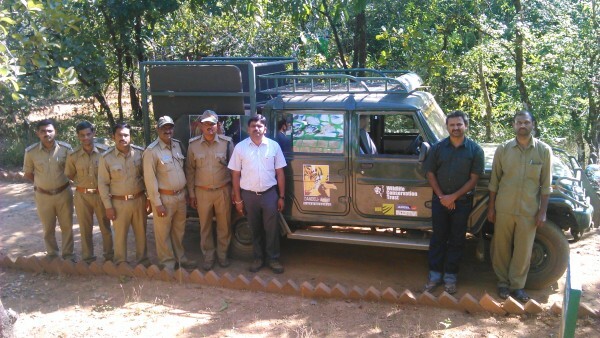 Sanjay Gubbi along with his staff, Senior Wildlife Veteran Dr Prayag H S attached to Biligiri Rangaswami Temple Tiger Reserve and others are trying to find the perfect time and location when they can recapture the Tiger. Assistant Conservator of Forests (ACF) Prashanth PKM is supervising the operation, which is headed by Deputy Conservator of Forests (DCF) Madhav Ambady. All the best to the TEAM. !